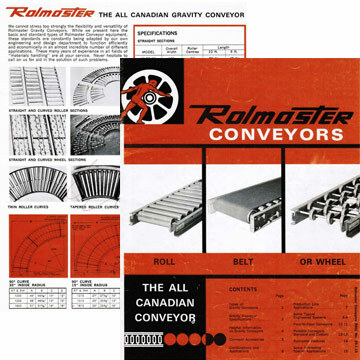 Rolmaster Conveyor was established in 1946 as a division of Belgium Standard, a Stratford based Machine shop. In 1993 the shareholders of Cambridge Pro Fab invested in Rolmaster as a means of expanding its manufacturing product line. This acquisition was figure-headed by George Figueiredo, owner/operator of Cambridge Pro Fab (Est.1988). Today, George, his son Kyle and Adrian Ferreira are the sole owners, with Adrian holding the position of president and managing daily operations. Over the years Ferreira has implemented many initiatives to assist the company in staying relevant within the material handling industry. Some of these include the implementation of new product development technologies, capital equipment investment, product line diversification, corporate acquisition and most recently the creation of a new in-house Marketing Department, all while maintaining and supporting the customer service their clients have become accustomed. In 2010 Rolmaster acquired Isseco, a 45 year old Brampton based conveyor manufacturer. The acquisition allowed Rolmaster to increase economies of scale and expand its customer base. Today the company maintains mutually beneficial relationships with more than 200 supply chain partners and over 90% of current sales generated by repeat customers.